Last month, Shirley Horn’s first album, “Embers and Ashes” recorded in 1960 and her “Where Are You Going” album, which was released in 1972, were reissued on a 2 LP on 1 CD reissue on Fresh Sounds Records. I have been waiting for “Embers and Ashes” to be released on CD since I first heard it a few years ago. “Where Are You Going” had been previously released on CD but “Embers and Ashes” had only been available on vinyl until now. Both albums are definitely a great additions for anyone who loves the music of Shirley Horn. Shirley Horn (vcl & p), Joe Benjamin (b), Herb Lovelle (d). Lewis Packer, and Harry Saunders, replace Benjamin & Lovelle on #8. Recorded in New York City, 1960. Shirley Horn (vcl & p), Marshall T. Harris (b), Bernard Sweetney (d) and Al Gafa (g, except on #13, 18, 20). Recorded in New York City, 1972. This entry was posted on Wednesday, October 13th, 2010 at 8:52 am. 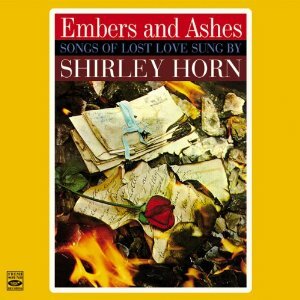 It is filed under Music News/Info, Shirley Horn and tagged with Embers and Ashes, jazz, piano, reissue, Shirley Horn, vocals, Where Are You Going. You can follow any responses to this entry through the RSS 2.0 feed.